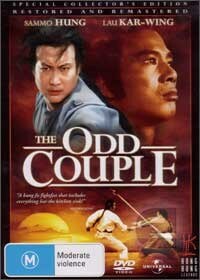 This is not 1968 Lemmon/Matthau Comedy, "The Odd Couple," which is what I was expecting when I signed up to review it; this is "Odd Couple," a Martial Arts comedy from Hong Kong (despite what it says on the label)! Since I don't watch many martial arts movies, I couldn't compare it to others in the genre; I had to judge it against the standard of a Hollywood film. So aficionados of the genre should take this review with a grain of salt. "Odd Couple" is not a new movie, it dates back to the 70s (though you couldn't tell that from the production values,) and the extras were quite interesting, especially the interview in which Director & Star Lau Kar-Wing discusses the changes to the industry since that time. He also makes no bones about much of the comedic inspiration deriving from foreign films of the time, especially those from Hollywood. It is clearly an amateur production by Hollywood standards, but also very much a labour of love for those involved, and its ambitions in areas like fight scene choreography would do any Hollywood action movie proud. The interview with the movie's bad guy, Leung Kar-Yan was also fascinating in showing how Hong Kong film culture developed its own unique clichés and kinesthetics. These extras give any viewer enough of a background in the style to permit enjoyment of the feature, and I recommend that anyone not familiar with Hong Kong martial arts movies watch them before the feature (as I did). The plot is one of two old rivals, who have been meeting to contest their skills against each other annually for 15 years, without result. In desperation, they decide to train an apprentice each and let them fight it out on their master's behalf. After ten years of training, the apprentices are at last ready to settle the matter when they are captured by the evil villain who had been defeated and humiliated by both masters on different occasions. To rescue their apprentices, they are forced to unite. The introduction sequence which reviews the different weapons used in Kung Fu is also interesting. Image quality is excellent (even if not widescreen), as is the sound (for the most part). Foley is the art of adding noises to film soundtracks that "sound" the way the action should sound if the blows, footsteps, breezes, etc, were real. Cannon films used to use heavily exaggerated Foley in the "Trinity" films starring Terrence Hill and Bud Spencer; this movie (and what little other Hong Kong movies I have seen) rely on similarly-exaggerated Foley to make the moves seem bigger and more violent. This results in a cartoonish quality in this movie, just as it did in the Hill/Spencer series of films, but it starts to get annoying when it is used this heavily. Also like the Hill/Spencer movies, the synchronization between dubbed dialogue, sound effects, and on-screen action is dubious at best. I have to admit that I quite enjoyed the "Trinity" series, and "Odd Couple" is their spiritual successor in more ways than I can readily count. I can heartily recommend this movie not only to fans of the Martial Arts Genre (Hong Kong branch) but also to anyone who enjoyed any of the Trinity movies. The infusion of b-grade western humour into an early Hong Kong martial arts movie works surprisingly well - at least in my book.